Oatmeal, whole wheat, flax seed pizza is a wholesome recipe and you will have no guilt of having a pizza again. This is a multigrain crust pizza with tomato basil homemade pizza sauce and topped with greens, sun-dried tomatoes, jalapenos, mushrooms. Using dill leaves as a topping gave a very mild and warm flavour similar to that of anise. Sun dried tomatoes are rich in nutrients, low in calorie, low in fat but high in sugar so despite of health benefits of eating sun dried tomatoes just the one with diabetes should be careful to budget this into their daily sugar intake before adding tomatoes to their diet. 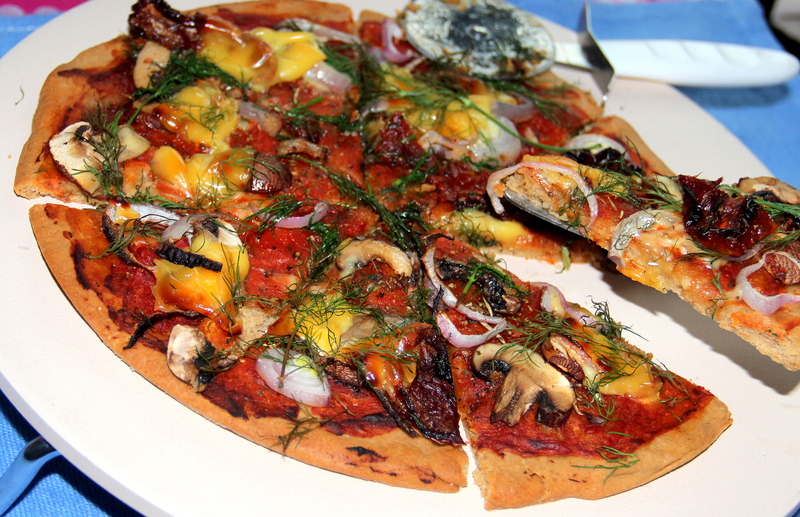 So top with any toppings of your choice and enjoy with this wholesome pizza. Grind oats and flaxseeds into flour in the magic bullet or blender. Pre-heat the oven for 220deg c grease the pizza pans with oil and dust some dry corn meal/flour. Now divide the kneaded dough to two equal halves and spread each dough as thin as possible and transfer this on to the greased pizza pans . Brush the crust with olive oil and bake them for 13-15mins at 220deg one after other. 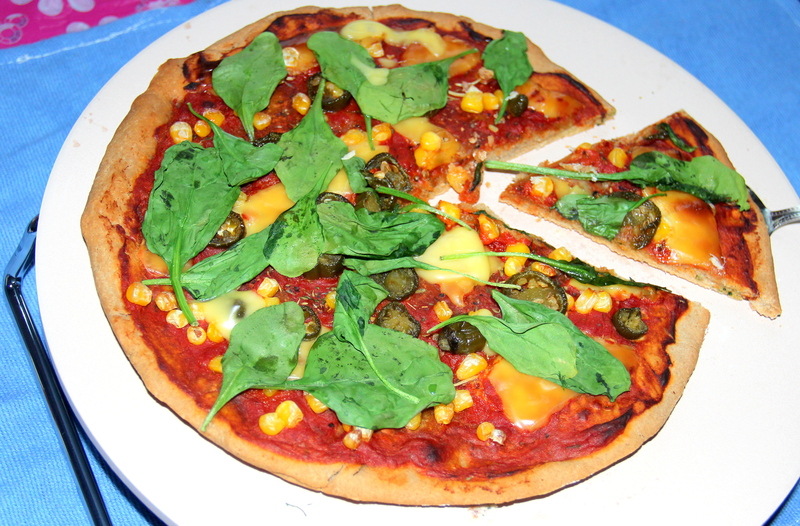 Greens can be topped once pizzas are baked or just top it at the end and bake for 1-2 mins. Feel free to top as per your preference. Posted on July 24, 2014, in International, Main Course and tagged Chitras healthy kitchen, drchdietfood, Healthy Veg Pizza, Healthy veggies to use for Pizza, Oatmeal Pizza base, Oatmeal veg pizza, Oats base pizza. Bookmark the permalink. 31 Comments. That pizza crust looks great! Fantastic. We do a lot of homemade pizza. One way I get extra nutrients / veggies in is to crush frozen leaves, beet, spinach or Swiss chard and mix with the tomato sauce. Even the adults can’t tell! Looks sooo yummy!Perfectly made Chithra!Let me ask u something?Is it the Olive oil that browns the crust,ofcourse along with the right oven temp? Dear shannu as you mentioned it’s oven temperature and brushing the crust both does make a difference as of my experience. … <3…. I can’t wait to try this! Healthy. And it looks soooo yummy! Those look delicious! I have a recipe for whole wheat pizza dough I need to do again. Unfortunately, I’m allergic to Flax so need to skip this recipe or omit it. Thank you so much for the visit on my site this morning. I appreciate it very much! yum this is delicious.. love how relativity guilt free this recipe is too. definitely saving to recreate in my kitchen. love it!